This paper will assume that you don’t live under a rock and you know what Disney/Pixar’s Cars is. Okay? Being a writer of science fiction, it may be thought strange that I finally got around to reading some. Mostly I read Stephen King, Terry Brooks and anything I found at yard sales. Now I can add Isaac Asimov to the lists of things I have read. A link to his works will appear at the bottom of the post. All the nerd stuff is there, like space travel and four legged aliens that would die in an oxygen atmosphere. But I found Asimov to be quaint, if not antiquated in his technology. Don’t get me wrong, even if I do not see the polished nature that I find in works from Edger Allen Poe, his plots are good. As a writer of long and short fiction, I see both sides to the coin, that short fiction can be polished to a shine. In long fiction there is no time for that. As I read the book, I did keep waiting for the technology to get smaller and there is not a hard mention of that until page 522, were he predicts computers being put in cars for autonomic driving. That is something that is just coming around. As we all know, computers were massive in the 1950s. But I wish to talk about a story that comes before that on pages 500-14 called “Sally,” and how the world of Disney/Pixar’s Cars has to do with Isaac Asimov. In “Sally,” there is a Farm with two human caretakers and fifty one sentient cars that are in a state of pampered retirement. They are never shut off, always having gasoline. That is another thing. As a mechanic myself, I have a pet peeve about calling an engine a motor. The fact that the cars use gasoline and oil is on page 503 and mentioned a few other times but the word motor is used over and over. I will say it one more time, so pay attention. An engine makes mechanical energy from chemical energy, a motor makes mechanical energy from electrical energy. Unless these cars are hybrid, which is not stated, it just looks bad to me. The motors are also stated to be “positronic motors” (507). Most would know this word from Star Trek’s Data, whom has a positronic brain. It is his CPU, his processor. Gasoline engines themselves process squat besides ground up corn or dead dinosaur bits. In an engine, the brain is called the ECM, or electronic control module. Separate from the engine and something he missed. While predicting the coming of self driving cars, Asimov assumed and missed on a big part of our culture. He thought that self drive cars would be too expensive for the average joe to afford, which we now know to be false. “We take it for granted now, but I remember when the first laws came out forcing the old machines off the highways and limiting travel to automatics…They called it everything from communism to fascism, but emptied the highways and stopped the killing…The industry specialized in turning out omni-bus-automatics. You could always call a company and have one stop at your door in a matter of minutes and take you where you wanted to go. Usually, you had to drive with others who were going your way, but what’s wrong with that?” (502). It turns out a lot. Many of us will take a bus. More of us just plain won’t. It is a symbol of American freedom and ingrained into our ideals of society. No politician will attempt to talk personal transport away because they will be shot. In the story the cars can hear (509) and have rudimentary communication skills, like blowing their horns, revving engines and opening doors. Disney gives their cars horns and revving engines to communicate, but also a spoken language. Asimov’s have a subtler form of communication that their caretaker, Jacob Folkers, even misses at first. The cars idle roughly to talk and he changes their gasoline thinking it is a problem (501). He has no idea it is how they express complex thought until page 514, after the cars deal with a threat. A man named Raymond J. Gellhorn wishes to pull the (sorry) motors out of the cars and put them into new bodies. We find that Gellhorn has already done this by putting a motor into a bus. But Gellhorn is a hack and does it poorly. “Even if it is a stolen motor, you had no right to treat it so. I wouldn’t treat it so. Solder, tape and pinch clamps. It’s brutal! Sure it works, but it must be hell for the bus. You could live with migraine headaches and acute arthritis, but it wouldn’t be much of a life. This car is suffering” (511). That would go to state the cars can feel pain, like Disney’s. We know from the story that they have enough emotion to growl and shy back like a dog (505) and to chase after Gellhorn to save Folkers. The car Sally, even “Slowly-lovingly you might say-her front door opened” (513) to let Folkers ride in her. It that story it is a big deal. Sally had not had a rider in five years before Gellhorn, I would use the term “violated her” by shutting her motor off then driving her (506). Riding inside a Disney car would seem impossible and a violation if accomplished. Disney’s cars develop loving relationships, and we know from Cars 2, they can kill without a problem. The character Finn McMissile, a British secret agent causes havoc on an oil well, causing the death of many cars. Not to mention the alternative fuel that Sir Miles Axilrod uses to blow cars up after a special beam is pointed at it. Gellhorn is found dead, killed by the bus that he built. We now know cars from both worlds can kill. This is when Falkers realizes that the cars talk to each other and other vehicles that come to the Farm. He begins to fear them, think that a lack of humans means never being turned off, the equivalent of being free. “There are millions of automatoblies (the way he spelled it so don’t look at me) on Earth, tens of millions. If the thought gets rooted in them that they are slaves; that they should do something about it… And they’ll have to keep a few of us to take care of them, won’t they? They wouldn’t kill us all (514). Even if there are no humans in the Disney world, things look a bit to similar. Albeit car themed, human influence is not hard to see. The road structure is there, along with race tracks, truck stops and everything else that would need to just up and run. When Lighting McQueen gets gas to go play with Sally, the gas nozzle just comes out. They used attachments and foot pedals to perform other complex operations. From the character Sarge, a green military Jeep, and British armed forces in Cars 2, we know they have a military. The cars would only come about after the extinction of humans, thus winning the sentient cars their freedom to never be turned off or used against their will, like the bus or Sally. And to go racing. I will take a moment to talk about a predecessor to cars. Disney put out an animated short in 1952 called “Susie The Little Blue Coupe.” Susie had a mouth and eyes like the cars in the Cars universe, plus she displayed emotions in about the same ways. The short is on-line if you would like to see it and loosely based on the book, Boy, Girl, Car by Gordon Buford. If you can find any information about that book, good for you cause I found nothing. Asimov’s “Sally” came out in 1953. I would not say that one could not have influenced the other much, and I will not say that Asimov’s story had a great deal of influence on Cars. I did not miss the fact that McQueen’s girlfriend is named Sally, like the car in Asimov’s story. I wish I could find another connection, but Sally is a convertible, not a Porsche, and her color is not mentioned. But in the tradition of Skynet, it puts a dark spin on the world of Cars, that a machine we created destroyed us then began to develop without us. 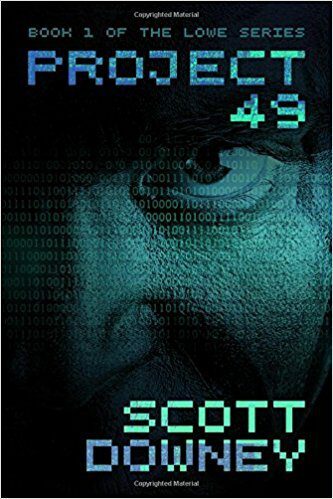 And speaking of dark stuff, don’t forget to check out Project 49, also on Amazon. If you buy the book I will stop bitching, I promise.